Ryan Kirkbride, Online Marketing Manager of Left Travel, was named one of Phocuswright’s 35 Young Leaders as part of its 2018 Cohort. 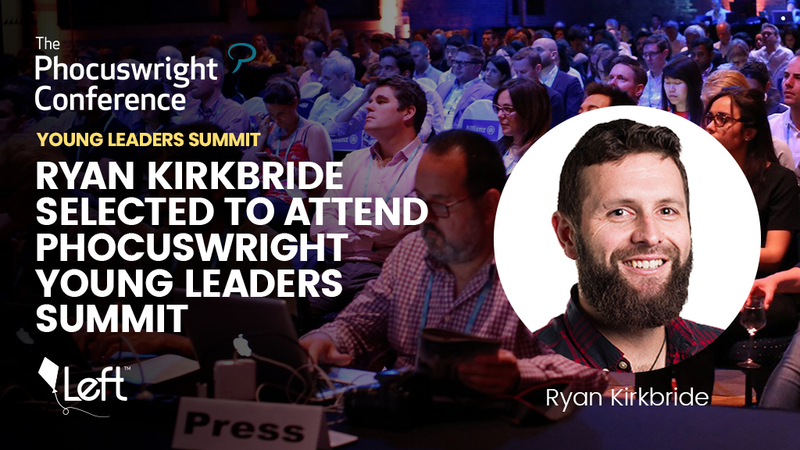 Left Travel is proud to announce that Ryan Kirkbride, Online Marketing Manager, has been selected as one of Phocuswright’s thirty-five young leaders under the age of 35. Ryan will be attending the Young Leaders Summit, which showcases the important role young leadership plays in the growth of the travel industry. The summit promotes executive management development by matching up the cohort with some of the industry’s leading experts. In addition, program participation exposes the groulep to today’s travel trends and builds connections to support them in driving strategy, innovation and growth. With over 10 years experience working in digital marketing, Ryan is passionate about building systems for sustainable growth. Heading up Online Marketing for Left Travel, Ryan oversees the teams in both the Canada and Bangladesh offices. As a key contributor to the global strategy, Ryan is experienced in managing a multi-million-dollar annual PPC budget. Prior to joining Left Travel, Ryan worked at HomeAway/Stayz and the Australian Stock Report. Ryan not only works in the travel industry, but he also lives it. As a passionate traveller, he has lived in 4 countries and travelled to 46. Ryan is looking forward to adding Bangladesh and Japan to the list in 2019. Established in 2012, Left Travel is an industry leading metasearch travel company. Our big data marketing engine uses predictive analysis AI to drive $650 million in gross travel booked annually. With access to over 14 million vacation properties in over 150 top travel destinations, we focus on the right data to convert high search intent traffic into quality bookings. Left Travel presently has 16 brands, most recently Meilleures Locations, and Ferienhauser & Ferienvermietungen. Left Travel is a subsidiary of Left, an award-winning BC Tech Company located in Maple Ridge.